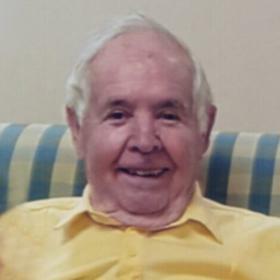 Mr. Earl Edward McCabe, age 87, passed away Sunday, October 14, 2018. He was born in Muskegon, MI on August 6, 1931 to James & Mary (DeVille) McCabe and served his country in the US Navy during the Korean Conflict. He married the former Anna Miller on July 4, 1953. Mr. McCabe had been employed as a sheet metal worker in the construction business for most of his life and retired from EMC Local 7 in 1993. 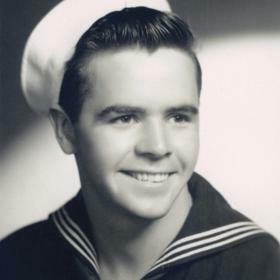 Earl was a member of St. Thomas the Apostle Catholic Church, Tatra Hall, USS Iowa Associates, USS Rochester, US Navy Cruise Sailors and was a life member of VFW Don Rea Post #8846. He enjoyed woodworking, fishing, hunting and gardening. The family wishes to thank Hospice of North Ottawa for the loving care provided to Earl and his family. He is lovingly survived by wife of 65 years, Anna; children, Daniel (Lori) McCabe, Kellie Lawrence, Earl D. (Betty) McCabe; grandchildren, Nathan McCabe, Andrew (Erna) McCabe, Danielle (Mark) Arbogast, Rachael (Ben) Novak, Adam (Alyssa) Lawrence, David McCabe, Matthew McCabe; 9 great grandchildren; siblings, Cecilia Langlois, Joyce Uganski, Patrick McCabe & Michael McCabe; many nieces & nephews. He was preceded in death by his parents; siblings, William McCabe, Bernice Devine & Ellis McCabe. Friday, October 19, 2018, 11:00 AM at St. Thomas the Apostle Catholic Church with Fr. Phil Shangraw officiating. Internment in St. Mary's Cemetery. Thursday, from 5:00 PM to 7:00 PM at Clock Funeral Home - Muskegon with a Rosary Service at 6:00 PM. MEMORIAL: In lieu of flowers, contributions in Earl's name may be made to Hospice of North Ottawa or St. Jude Children's Hospital.